Mike Caruso, Orland Park Consolidated High School District 230, USA "CACHEBOX is working beautifully. It's easy to work with and we're happy with it." Carlos Ocasio, Tech Director, Friends Select School, USA "We used to offer speeds between 500 and 800Kb/s but now we can offer an 800Kb/s minimum and an average of 1.5-2Meg per second"
CACHEBOX doesn’t just include caching as one of several features on a device with broader functionality. 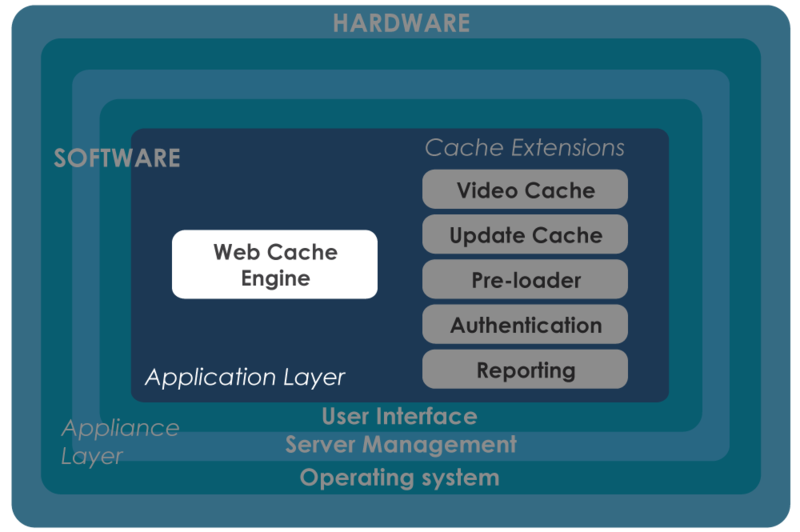 Its highly tuned cache engine and cache extensions are designed to give you high performance and versatile caching. CACHEBOX‘s core caching engine utilises Squid, the open source, industry-standard web caching server. Through years of experience and extensive testing, ApplianSys’ web caching experts have been able to tune Squid’s configuration and storage schemes to offer extremely high performance compared to a standard installation of Squid on a Linux server. CACHEBOX’s user interface makes it easy to access commonly-used features of Squid. Administrators who are familiar with Squid can take finer control than the standard interface allows by using Squid commands through a special part of the interface. As part of ApplianSys’ unique server appliance technology platform, CACHEBOX has the simplest, most intuitive and easy to use Graphic User Interface on the market. You don’t have to worry about complex configuration or increased administrative burden – CACHEBOX will make it easy to optimise bandwidth, save money and improve your users browsing experience.